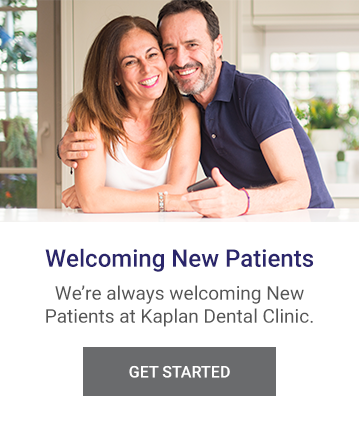 Dental implants from Kaplan Dental Clinic are a great option when it comes to replacing your missing teeth and improving the aesthetic appearance of your smile. Dental implants have revolutionized the world of dentistry. Before implants, individuals with missing teeth experienced trouble chewing, speaking, and a host of other long terms issues. We offer dental implants to replace your missing teeth, repair the functionality of your teeth and mouth and to ensure the aesthetics of your smile. A dental implant is a permanent tooth replacement that is surgically attached to your jawbone using a titanium post. Because an implant is surgically positioned to your jaw, they will not come loose like a denture can and they do not have to be attached to your other teeth like bridges. Over time, bridges can be damaging to the other remaining natural teeth and they do not last as long. Implants are screwed directly into the jaw which prevents the breakdown of the jaw bone and muscles that may occur under a missing tooth. The first step in the implant procedure is making an incision in the gum tissue over the area of the missing tooth. Your dentist will then prepare an area of the jaw bone for the implant to be screwed into. Once the implant has been attached to the jaw bone, the gum tissue will be sutured closed. The implant procedure is a relatively painless and comfortable procedure that can be performed under local anesthetic. Once the implant has been placed, you will generally have to wait several months for the jaw to heal before the tooth is added to the implant. If you have one or several missing teeth and are interested in learning more about dental implants, contact Kaplan Dental Clinic today!